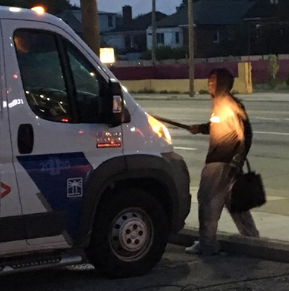 Journalists from a Detroit radio and TV station were attacked Thursday while on assignment on the city's west side, according to USAToday citing news reports. Reporter Mike Campbell of WWJ 950 AM, reporter Nia Harden of WXYZ-TV7 and photojournalist Mike Krotche of WXYZ-TV are safe. But their company vehicles, which displayed the logos of their stations, were damaged. At about 6 a.m. ET, Campbell was in the middle of a live report on a hit-and-run crash that killed a pedestrian when a suspect came up to the station's car and struck the windshield and driver’s-side window with a metal baton, WWJ reported. "My truck just got hit by a bat, and I'm sorry, guys, I've gotta go," Campbell said while reporting live. The suspect previously had interrupted Harden while she was reporting live, she said in a Facebook Live video. The man then approached Harden and Krotche again, according to the WXYZ report. 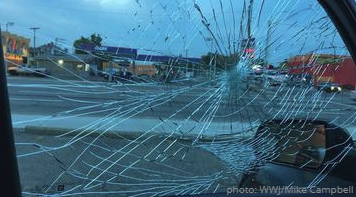 He smashed the windshield and damaged the side mirror of their live-news truck. "I had put the windows up because I had started my report and I saw the man," Campbell said as part of the radio station's report of the crime. "But he seemed to be just walking by in front of the truck. He was saying stuff, but I put the windows up because I didn't want our listeners to hear his foul words. "And then he apparently, just, something angered him, he turned around and attacked the news truck," Campbell said. He also apparently smashed other vehicles as he walked away. Both media outlets reported that the man is in police custody. Police also have not released charges or a motive in the attack.